Finals aspirants Macedon and Riddell fought hard for supremacy at Tony Clarke Reserve in a worthy opener to the Riddell League’s 2019 season on Saturday. The Cats eventually won by 14 points in a low scoring match which had unexpected twists and turns, overall using the ball better than the Bombers who suffered from inaccuracy and instances of ill-discipline. 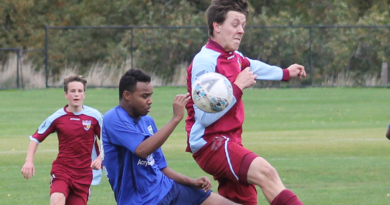 Macedon’s quality forwards Jason Cooke and Daniel Markworth produced seven goals between them, and Riddell’s hopes evaporated early in the last term when in-form Paul Sahlberg was red-carded and sent off, invoking memories of the contentious 2018 grand final. Bombers’ top recruit Gavin Urquhart limped off in pain almost at the same time, with Macedon immediately seizing the momentum with two quick goals, then defending with the advantage of an extra man. While players and spectators seemed perplexed at times by umpiring decisions, it’s safe to say both sides should end up in the final six unless they are hit hard by injury and/or suspensions. It was very obvious Macedon and Riddell had plenty at stake from the opening bounce, and forwards found it hard to make an impact in a see-sawing first term. The Cats edged ahead in the second term as Cooke and Markworth slotted long goals; in contrast the Bombers had plenty of the ball, but Ethan Foreman (back from Kyneton) and a busy Dylan Tarczon missed shots from within easy distance. Leading by eight points at half time, Macedon soon extended the advantage before Riddell finally found some system and came back hard with four unanswered goal to hit the front late in the third term. Speedy Bomber Matt Panuccio looks set for a good season, and winger Rylie Paterson (ex-Gisborne) was impressive in his debut for the Bombers. Respective ruckmen Tom Waters and James Nolan had a good battle. 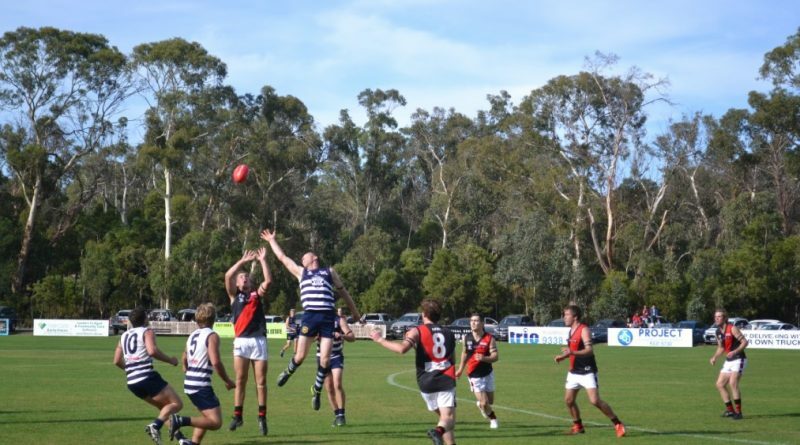 With two points the difference the match was very much alive, and Macedon coach Ben Tankard gave his players some precise instructions at the last change, stating that one-on-one the Cats were better, but the Bombers had shown a better running game. Riddell missed a change to regain the lead, and Macedon scored the first goal of the last term. Then came the Sahlberg send off, and Urquhart injury, and it was long odds on a Riddell revival. Last season the margin between these sides was one and two points (honours shared) and the return bout this year is on July 13. Expect it to be close again. Woodend-Hesket ran away in the second half to topple Lancefield by 100 points, but the Hawks now have the bye this Saturday, then a “holiday” on the Easter weekend…hardly a smooth start to a new season. 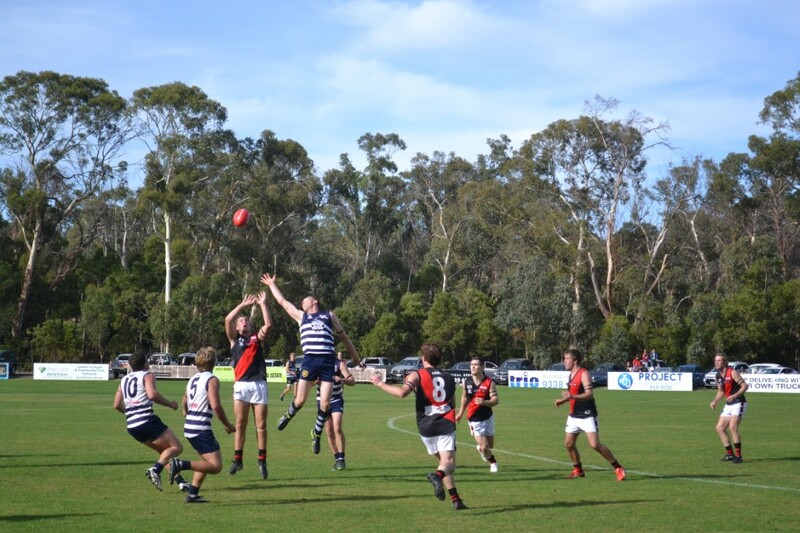 Romsey had the bye, and go to Rupertswood this Saturday for what could be a very interesting encounter, while Riddell is at home to Diggers Rest in another top flight match. The U19s comp sees four of the 11 clubs without teams, namely Romsey, Macedon, Broadford and Rockbank. Full marks to Lancefield for finally getting an U19s side on the field after several years’ absence. The young Tigers proved competitive against Wooddend-Hesket. 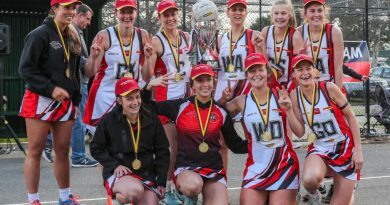 Macedon secured a clean sweep of four wins over the Bombers in netball, but both A Grade coaches in Ciara Stewart and Lauren Close were happy with future prospects. While the reigning premiers were matched early by the Bombers, the Cats made some experimental moves and asserted authority in the second half. Recruit Hayley Mathews hardly missed a goal, and with 2018 Ryan Medal winner Chloe Wilson, will form a formidable scoring duo. Close was sidelined by an injured foot for much of the game, and was not perturbed by the 33-shot deficit at siren time. “We had players at a wedding, and will be much stronger as the season progresses,” she said. Lancefield was welcomed back to A Grade, but found the young Woodend-Hesket combination too strong. 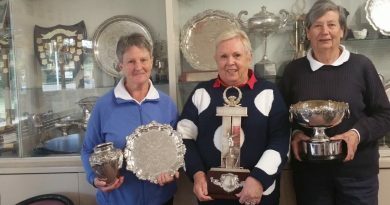 Left to right Julie Harris - C Minor Champion, Denise Murphy - Club Champion, Deidre Dawes - B Minor Champion.